Want that sophisticated dinner table, but not quite sure how to do it? The first classy addition to your table top should always be a practical and clean pitcher. Store cartons and juice jugs just won't do it. This set of 2 pitchers is perfect for that chic touch. Sparkling clear glass, with a modern design, this restaurant inspired carafe set will have you dining in style. Use for water, wine, orange juice, lemonade, milk, tea or ice coffee. In a sleek bottle, the drink will be so much more tempting and will only add to your tables aesthetics. You can keep both on the table for a variety of drinks, or have one ready in the fridge to pull out a cold drink with no mess or hassle. Classic and clean, these carafes are designed for a fresh appeal in your home, at a restaurant or a bar stand. Perfect for a crisp cold drink every time. Just the right size to lift and pour without spilling and without refilling too often. Also perfectly sized to empty that store carton - these bottles hold 1 liter each - that's up to 34oz. LONGLASTING QUALITY - Made of durable glass this carafe is sturdy and reusable. This bottle can hold 1 liter of liquid - just the right size to empty that store carton. VINTAGE EMBOSSING - Designed with the antique Main Street symbol for a chic look, and country style appeal. Classic shape and slender neck allow easy pouring and handling. 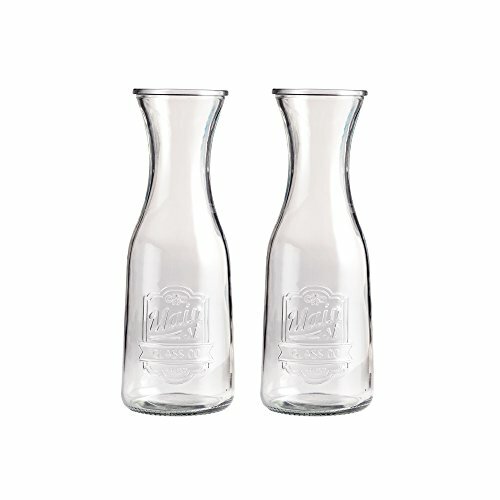 SET OF 2 BOTTLES - Always have a cold drink on hand with this set of 2 bottles. Use for water, wine, orange juice, lemonade, milk, tea or ice coffee. RESTAURANT & HOME USE - This practical set gives a clean design to your dinner table. Great for store bought or homemade drinks. Use for everyday or when hosting. Measures approximately 3.5x4x10.5". Capacity 34oz.